Beautifully designed and well made magnetic "Things to do / Shopping List" Notepad by Quire. Size is 245mm x 100mm. 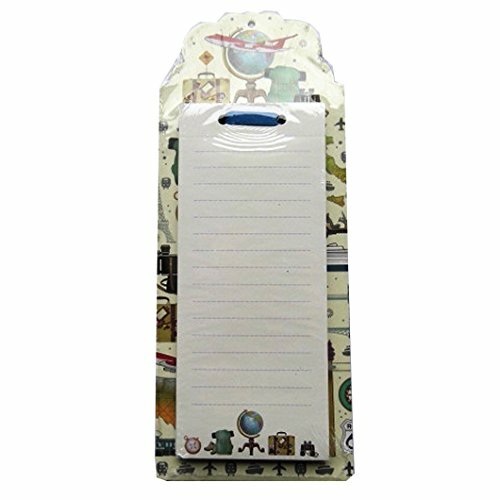 This notepad is mounted onto a thick board backing with various travel scenes forming the design and decoratively die cut shaped at the head. The notepad itself measure 185mm x 70mm and also includes the same travel design along the bottom. Comes with 60 sheets of 90gsm Brilliant White Writing Paper and is bound and tied to the board backing with red ribbon with each sheet perforated at the head so it can be torn off if needed. Back of the notepad includes 2 large magnets for placement on any metal surface such as a fridge or freezer and also includes a drill hole at the head for hanging. Great all round magnetic notepad with a lot of detail to use around the home or office, also great to give as a gift. Beautifully designed and well made magnetic "Things to do / Shopping List" Notepad. Size is 245mm x 100mm. This notepad is mounted onto a thick board backing with various travel scenes forming the design and decoratively die cut shaped at the head. The notepad itself measure 185mm x 70mm and also includes the same travel design along the bottom. Comes with 60 sheets of 90gsm Brilliant White Writing Paper and is bound and tied to the board backing with ribbon with each sheet perforated at the head so it can be torn off if needed. Back of the notepad includes 2 large magnets for placement on any metal surface such as a fridge or freezer and also includes a drill hole at the head for hanging. If you have any questions about this product by Quire, contact us by completing and submitting the form below. If you are looking for a specif part number, please include it with your message. Paris Eiffel Tower Purple and White Striped Notebook 7" x 5"